An exceptional cruiser, workhorse and dune basher – is there no end to the new Disco’s talents? A few weeks into its tenure as our long termer, the Discovery has proved to be exactly as I suspected from the beginning: a brilliant companion as a daily driver that excels at practically anything you ask of it. 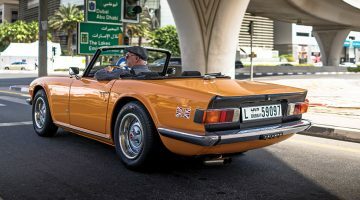 Its commanding driving position means you can see what’s going on around you – always useful during the Dubai daily grind – and the punch from its muscular engine is sufficient to make rapid progress whenever required. In fact it’s difficult to find anything at all to complain about, even for a hardened motoring hack that normally takes no prisoners. Its rear end still hasn’t grown on me and it’s telling that aftermarket accessory suppliers are now starting to tout panels that balance out the lopsided looks by allowing you to reposition the number plate centrally, which is where it should be. There’s also a lot of bulk here – when I park it next to my own Volvo XC90, it looks truly enormous but that, I suppose, is the price we pay for ultimate practicality, for the new Disco is first and foremost a vehicle for families, and adventurous ones at that. Apart from using it as an exceptional distance coverer, the Discovery has been pressed into service as a proper workhorse for evo’s tireless staff. While that meant me being relegated to the trusty Swede once again, the guys used it for location scouting in city and desert, with both extremes being tackled with equal aplomb. There were never any issues in getting to even the most remote spots via often extremely rough terrain and, as you would expect, there was always more than enough room for a full compliment of passengers and all the kit required for a professional photo or video shoot. 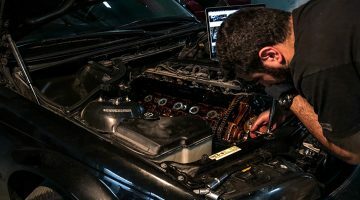 It didn’t take long for the odometer to rack up the kilometres and, at 13,000, it was time to take it to Al Tayer, the official Land Rover dealer in Dubai, for its first proper service. Oils and various filters were changed, brakes were inspected, the book was stamped and we were able to collect it and drive away the same day. The more the Discovery was used by the evo team, however, the more things started to niggle, albeit in small ways. Fuel consumption, when loaded down with crew and kit, especially when off-roading, erred on the high side, while the two rows of rear seats felt like they needed more cushioning for longer journeys. They’re a bit stiff and uncomfortable, especially when compared to the armchairs up front. It might give off the vibe of a previous gen Range Rover but there’s obviously the occasional compromise here and there. One thing we’ve not covered yet, however, is the way this Land Rover behaves off-road. 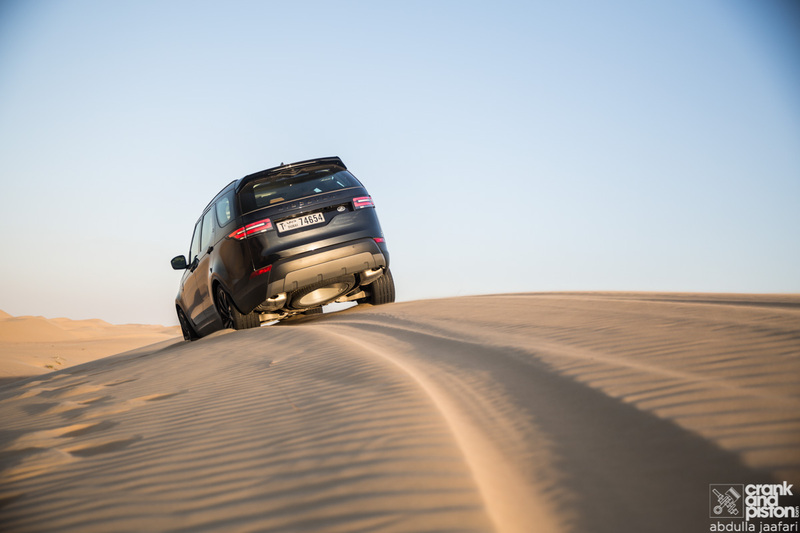 When you see drivers bashing the dunes in these parts, normally they’re in Land Cruisers or Patrols – it’s highly unusual to see a green oval badge anywhere in the desert and that’s an injustice. Throwing caution to the wind, we decided to deflate the tyres and give the Discovery a punishing desert session to see what it’s made of. 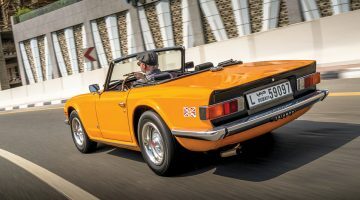 And it turns out it’s as capable as anything else we’ve driven off-road – confident, sure-footed and forgiving, even if it did feel a little top-heavy thanks to its height. It’s a remarkable car, this, and now that we’ve handed it back having covered 6239km in its tan upholstered cabin, we’re missing it already. ENJOY OUR LAND ROVER DISCOVERY LONG TERM REVIEW?